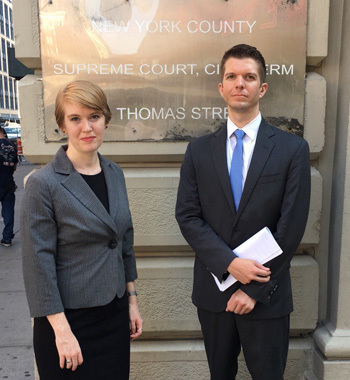 Travis, along with Staff Attorney Katie Deabler and intern Karina Tefft, also attended a rally with our clients, National Mobilization Against Sweatshops and Chinese Staff and Workers Association, prior to the hearing. Dozens of home health aides impacted by the rule attended the rally and the hearing. The case is pending in New York Supreme Court, and was filed with our co-counsel, Virginia & Ambinder.